As recently reported by Vietnam Briefing, Vietnam is on track to become the largest supplier in ASEAN to the United States. With its growing role in supplying goods to the U.S., it’s time to take a look at why American companies should be interested in investing in Vietnam, if they’re not already there. Vietnam is one of the few countries that is involved in every major trade pact currently in existence, or presently being negotiated, in the region (ex. ASEAN, RCEP, TPP, and APEC), along with Singapore, Malaysia, and Brunei. If all the trade deals are enacted, Vietnam would be in the enviable position of being a low-cost manufacturer with free trade access to some of the world’s largest economies. These agreements are advantageous for investors because they take down barriers to trade between countries by removing protections for local industries. Depending on the terms of the agreement, they can reduce, or completely remove, tariffs and quotas. Removing these trade restrictions enables more foreign investment because entry into the market becomes easier and potentially less costly. The Regional Comprehensive Economic Partnership (RCEP) would cover the Asia/Oceania portion of the Pacific coast. If enacted, this free trade agreement (FTA) would provide Vietnam with tariff free access to China, India, Australia, Japan, and South Korea – this would make Vietnam a key sourcing destination for foreign investors. Any manufacturer setting up in Vietnam with an eye towards exporting into other Asian countries should be tempted by the reach of the RCEP. If the RCEP is not enough to convince investors to enter the region, the Trans-Pacific Partnership (TPP) is another potential FTA that is scheduled to be ratified next year. However, the TPP focuses more on the Western Hemisphere. The major players on that side of the Pacific Ocean would be the United States, Canada, and Mexico. However, ratification of the TPP is by no means a certainty, it remains to be seen whether the newly controlled Republican Congress in the U.S. will put aside their antipathy towards President Obama and push forward with their free trade principles and support the TPP. If the above trade agreements come to fruition, as well as the EU-Vietnam FTA deal currently in negotiation, then Vietnam would have free trade agreements in place with the world’s three largest economies, as well as five more economies within the top fifteen in GDP. And of course, Vietnam is currently a member of the Association of Southeast Asian Nations (ASEAN), which has a GDP of US$2.1 trillion, and a population almost double the size of the United States. Having tariff free access to all of these countries is a huge lure for any business looking to expand its operations internationally. By joining all of these agreements, Vietnam has positioned itself as a key hub for future global commerce. A plethora of trade deals is not the only enticement for foreign investors to come to Vietnam. Access to a large supply of low-cost, skilled labor is another key feature that is attracting foreign investment into the country. As companies struggle to cover their rising costs in China, there is an increasing trend of investors looking to Vietnam in order to diversify their holdings and reduce costs. Labor costs in Vietnam are currently 50 percent less than those in China. 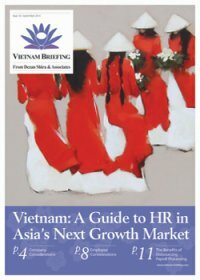 Companies already in Vietnam cite low-cost labor as one of the chief reasons that they have invested into the country. The Vietnamese government is continuing its efforts to make the country more inviting for foreign businesses. Earlier this year, Vietnam discussed amending its Investment Law to simplify procedures and target higher quality investments. Examples include new high-tech parks, the growing coffee industry, as well as textiles. The government also realizes that current infrastructure needs are not adequate for the level of foreign investment it is trying to achieve, thus it is spending to improve roads, rail links and airports. Lastly, unlike other countries in the region, Vietnam has a stable government and political system. Companies investing into the country can count on a supportive government that is keen to expand foreign investment. They don’t need to worry about destabilizing influences that may put their investments at peril. Any United States based company would be wise to consider investing into Vietnam as either a first step into Asia, or as a means of diversifying their Asian holdings. There is significant growth potential in the country, both for exporting as well as domestically. Domestic consumption is predicted to increase at a rate of 20 percent per year – with a population of over 90 million and Southeast Asia’s fastest growing middle class, Vietnam clearly represents an important market for foreign goods. And if the proposed free trade agreements are ratified, then global free tariff access will only make Vietnam more attractive.